Do you have a minute to spare to learn some English? Kee's going to explain the differences between until and by. Give us 60 seconds and we'll give you the English! Hi guys! 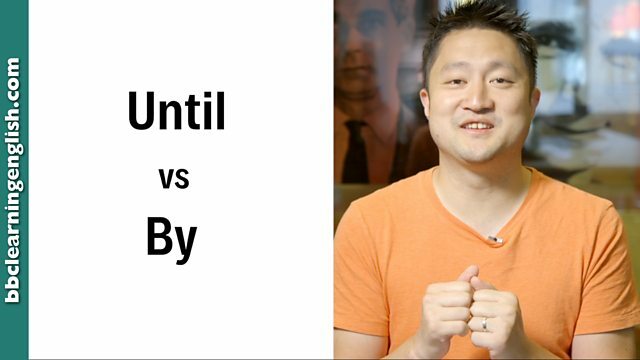 This is Kee from BBC Learning English, and today I'm going to tell you the differences between until and by. We use until to talk about doing something up to a certain point in time. If I say: I have to take care of my dog until 5pm, it means I will start taking care of my dog now and stop taking care of it at 5pm. On the other hand, we use by to talk about doing something before a future time or deadline. If I say: I have to finish an essay by 5pm, it means I can start any time but I will make sure that at 5pm I have finished writing the essay. So, I may even finish it at 3pm or any time before 5. So we use until to describe doing something up to a certain point in time and we use by to describe doing something before a future time or deadline. Until is used to talk about doing something up to a certain point in time. I have to take care of my dog until 5pm. Until the rain stops, we can't go to the beach. I will be working until this evening. We can meet for dinner after that. By is used to talk about doing something before a future time or deadline. I have to finish an essay by 5pm. The council expects the bridge to be finished by December. By the time I come back, I want this room clean. Is 'until' used for doing something before a future time or deadline? Which of these is used to talk about doing something before a future time or deadline? Look at the structure of the sentence to help you. Does the sentence talk about doing something up to a point in time (by) or doing it before a future time (until)? Complete this sentence: I think my project will be finished _____ the end of the month.